Catalase is an enzyme produced by microorganisms that live in oxygen-filled environments to protect themselves from the oxidative damage of hydrogen peroxide (H2O2). Hydrogen peroxide is a by-product of cellular respiration in microorganisms that utilize oxygen. Catalase hydrolyzes hydrogen peroxide into water and oxygen, which are nontoxic. Image 1: The reaction catalyzed by catalase. Catalase test is done to determine the presence of catalase in microorganisms. The test can aid in the identification and differentiation of different microorganisms. Catalase hydrolyzes hydrogen peroxide into water and oxygen gas, which is demonstrated by the immediate formation of bubbles (fizzing). Using a sterile inoculating loop or sterile wooden stick, get a small amount of an 18- to 24-hour old microbial colony, and place it on the clean, dry glass slide. Avoid picking up any agar, especially if using agar that contains red blood cells. Red blood cells contain catalase, and would yield false-positive results. 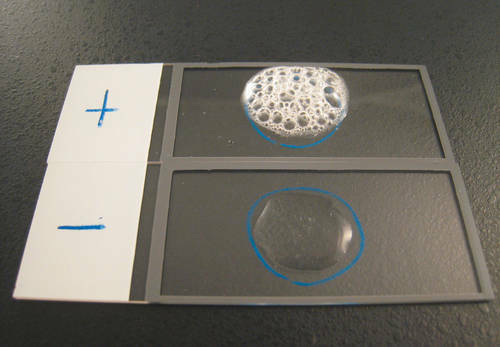 Using a dropper, add a drop of 3% hydrogen peroxide to the bacterial colony on the microscope slide. Picture 2: Slide method for catalase test. Add 4 to 5 drops of 3% hydrogen peroxide to a test tube. Using a wooden applicator stick, get a small amount of an 18- to 24-hour old microbial colony, and place it in the test tube. Avoid picking up any agar, especially if using agar that contains red blood cells. Photo 3: Tube method for catalase test. 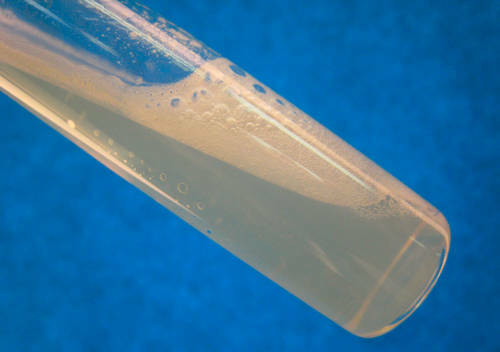 Add 1 mL of 3% hydrogen peroxide to an 18- to 24-hour old microbial culture grown on a nutrient agar slant. 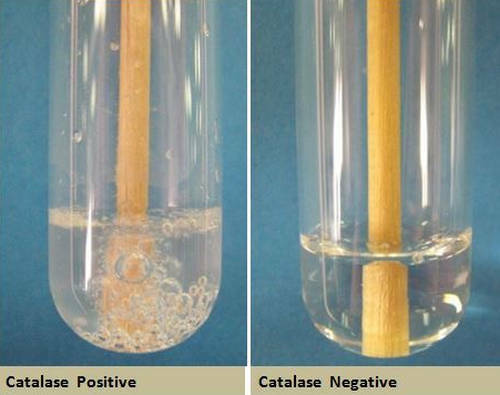 Image 4: Positive result of slant method for catalase test. For routine testing of aerobes, 3% hydrogen peroxide is used. For testing of anaerobes, 15% hydrogen peroxide is used. In this case, catalase test is used to differentiate Clostridium and Bacillus species. A host infected with bacteria produces phagocytes and neutrophils to fight against the infection. These cells produce peroxide to kill the bacteria. The enzyme NADPH oxidase produces superoxide within the phagocyte, which is converted through hydrogen peroxide to other oxidizing agents, such as hypochlorous acid, to kill pathogens. Always practice strict aseptic technique. If possible, perform the catalase test in a biosafety cabinet. For microorganisms grown on blood agar plate, be careful not to pick up any of the blood agar. Red Blood cells contain catalase and would yield a false positive test. Microbial culture should be 18 to 24 hours old. Hydrogen peroxide must be freshly prepared because it is unstable. It must be stored in dark colored bottles and refrigerated, to prevent decomposition. An iron wire inoculating loop must not be used because it would react with hydrogen peroxide, and yield a false positive result. Some bacteria produce peroxidase, an enzyme that converts hydrogen peroxide into water.